Sometimes it is not enough to feel that you wrote a lot. Sometimes you need to see it. That's what Writer's Trail is here to do. Share with your writing buddies! 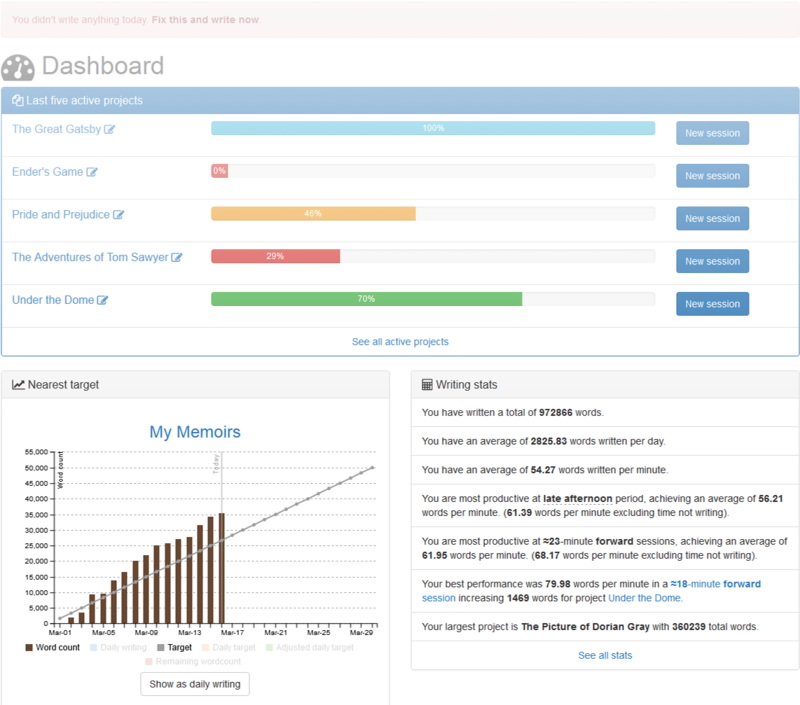 You can make any amount of projects and each one has its own individual progress bar. Archive them to avoid cluttering the list. 50,000 words in 30 days (as is&x#0020;NaNoWriMo)? 100,000 in 45 days? You can choose what you want and even change it midway. There's no hard choice of writing sessions length. You can put minutes and seconds, set paused time, mark it as forward and as countdown. Ever wondered if you are more productive at evening or early morning? The best session length? Now you can know that for sure. You can use our watches to keep track of your writing time. Use for your lonely wordsprints late at night (or as you wish). We listen to our users and try to make everyone happy. If you provide feedback, you may wake up to see the new feature online! Have a peek at Writer's Trail features. If you like this tool, consider donating to keep it live and free. Follow us at and to be one of the firsts to try out Writer's Trail.